As part of our Developing Nations Scholarship Program, LifeNets decided to help some of its students with laptop computers support. We have helped in this in some of the countries we provide scholarships. Some courses of study are quite computer intensive and to have access to crowded computer labs often with outdated computers was not helping their studies. A laptop computer accelerated their education. We always provide a backpack so that the student can keep the computers close by. In some cases we have also provided a bicycle to help the students with transportation to school. I always use an HP Compaq laptop for my school work. I have books in the computer which I use for studies. I do the school projects and assignments as quickly as I can because I have my own computer. Surfing the Internet is the best for me because I increase knowledge for my studies from browsing different websites. Even informal studies at home are very effective because of the laptop. I collaborate with friends to accomplish the college work, and communicate and bring increased enthusiasm. My school has very few computers and this creates pressure on work. Therefore, the opportunity of having my own computer reduces such inconveniences due to much work which I have that needs to be submitted while typed and printed. In this respect. I am now able to work on my computer at any time even during old ours therefore this machine is helping me a great deal. Without this computer I would have been in great problems. Thanks to the LifeNets for providing me with one computer. My appreciation to the donation of the laptop is just too great! LifeNets is indeed a life changer. It has really helped me to become competent to the world of technology. Being a student, I do polish off the research segments and other assignments at college easier and be able to present my work to the lecturers effectively. I put my laptop to the maximum use of modern technology, especially in conducting research and developing materials for School. The laptop has made me so skilled in typing that I find it easy to take notes and research stuff online. The laptop does not only help me on my computer studies but also for the Church activities. I produce some church records to help our ministers always have all updated required information at hand. 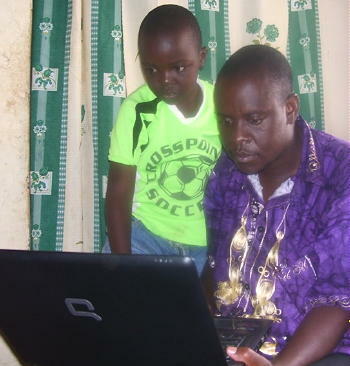 Also as a LifeNets representative, the computer is helping me in managing scholarship and livelihood projects information, and communicating with colleagues through the Internet. I have been using the laptop to send data to LifeNets such as progress reports, new applications and also a monthly accounting record. It has been quite good working on my own computer from LifeNets over the past three years. This has been a thing that I never dreamed sometime back that I will be exposed to this technology. In our country, it is very expensive to buy a computer. Many people cannot afford to buy laptops. Most of the students in various ICT Colleges do share some few computers. For instance, 8 students may use one terminal. Some schools uses only one computer and others do not even have one and it’s sad to ICT students. LifeNets also thought of comfortability and security aspects when traveling with these computers. We are very thankful that the back bags were thought as a solution to carter for this. 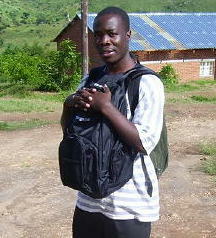 We are able to carry the laptops on our backs walking in the town streets without safety problems. The notebook computer I received from LifeNets last year has helped me tremendously especially with my computer studies course. Before I received this from LifeNets I was facing a lot of problems that would have made me to fail my course. It helps me to do the practical part of the course even at home. I’m now able to submit my school projects in time since I now have the computer which I use to type my projects and later print it. I am now able to make research of the school project on the internet since I now have the computer. Thanks to LifeNets. 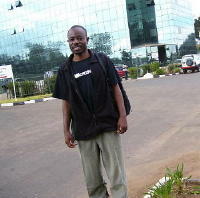 I am now able to download electronic study books and able to read then even when am off- line. I am able to edit my Curriculum Vitae (CV) while schooling; this will increase the choice of setting of job after my school. During my free time the computer allow in terms of entertainment EG; listening to songs. I think that the laptop computer has helped me a lot in many ways and I think that they will help me in the future. I always use the internet to search for information which is the main source for the assignment information at college. The laptop is also used to store the information for my private clinic business. I prepare monthly pay slips for my employees. I am able to type and print some documents for school and my business. I have my business letterhead that I designed using the laptop I got from LifeNets. I am very thankful because of this wonderful donation of a laptop. 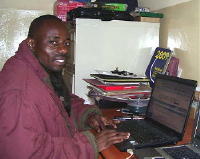 The Compaq laptop is helping me very much, mainly at work, church activities, LifeNets and also my studies. I do manage Good News requests for those who requests through the Internet. So I use the laptop which I got from LifeNets. It also helps me when I am preparing accounts for the church and LifeNets. It acts as storage for the Church's and LifeNets information, e.g. grant requests and photos. We are in the process of changing the processes and procedures at Bottling and Brewing Group Ltd (SOBO, Carlsberg and Malawi Distilleries Ltd) where I am working. I am part of the team so I use the Laptop because I have to work late so I prefer working at home because the Company cannot afford to give us Laptop. I also use it whenever I have been given assignments at work. The laptop also helps me in my studies. I use the Internet to find latest information for my studies as well as for my work. As a member of Association Chartered Certified Accountants I am always updated through the Internet on changes and updates, so I use the Compaq laptop. Thank you for giving me the laptop it is helping me very much.